More on Matera is coming, but first I am taking time to post on events of the past few weeks. It was Labor Day weekend and a big bday celeb for my partner had been planned. It was one of those knock-off number of decades that requires a mention. As chef for the family and friends I planned dinner with the intention to keep it simple. My granddaughter would come to visit for the first time and my preference was to spend time with her rather than be in the kitchen. First, I contacted D’Artagnan one of the finest purveyors of meat and fowl in the country and ordered organic smoked duck breast and rabbit legs. When the guests arrived they were shocked to see fowl and rabbit coming out of my usually vegan kitchen, but none of them got foul with me about my choices. A smoked duck appetizer was followed by gazpacho. OC chef Carlos Salgado of Taco Maria told me to soak the tomatoes in a little sherry vinegar and the cukes in champagne vinegar. The sherry gave just the right zing to the creamy texture of the processor-ed tomatoes. Using Angela Cook Gardener’s recipe I marinated the rabbit legs in buttermilk, paprika, cayenne, garlic powder for eight hours. Drained them in a colander, shook them up with flour in a brown bag just the way my mother used to, and fried them in canola oil. We finished off with a cake, thin layers of chocolate separated by salted carmel, filling from Konditorei, a fine Austrian bakery in Davis and topped with a dollop of caramel ice cream. Basically, a simple, no frills dinner, but the diners seemed satisfied. The following day after the guests and out of town family departed my partner and I headed to the city to continue our celebration. When it comes to food, I don’t know of any place on the west coast that does it better than San Francisco. LA is finally on it’s way. Portland although a bit meat heavy for my taste, does it well. Seattle, not bad the last time I visited, but San Francisco is the gift that just keeps giving. Our agenda included reservations at three new-to-us restaurants. We also made quick stops at a few old standbys: Delfina, Tartine Bakery, and The Slanted Door. All three continue to live up to their long and upstanding reputations! We discovered 1760 the newer restaurant from the owners of Acquerello on Eater.com. It was the first we would try on our list of newbies. We arrived at 6:30 and were seated promptly. With local pub-like ambience it’s a casual place. Our first appetizer a crudo was topped with a crispy veggie that I could not identify. It had a strange taste, did not pair well with the fish. It was a tough chew, but I kept at it hoping to id the weird item. Finally, I asked the wait-person who identified it as daikon. Shocking. Daikon can be tricky, but generally the longer it is sautéed or roasted the sweeter it grows; in this case bitter, it left a bad taste in the mouth. The daikon along with a parsimoniously doled out second appetizer prompted us to get the check and leave. I rarely do this, but so turned off by the first two courses I could see no reason to stay. Later I heard that 1760 has had “issues.” Perhaps a second try will be down the road. It turned out that our favorite Italian wine shop Biondivino was only a few blocks away. We decided to head over for some of their bruschetta. Emanuele Fromento from one of Genoa’s leading wine bars initiated a bruschetta pop-up for the month of August. With the pop-up so popular owner Ceri Smith decided to continue with the city’s first bruschetteria serving over a dozen including pesto, Taleggio, prociutto cotto from 6 pm Wednesday through Sunday. Ceri Wine Director of Tosca named by Bon Appetite as one of the top ten new restaurants of the year is also Food and Wine’s Sommelier of the Year for San Francisco. It’s a great place not only to sample Italian wine, tastings are held regularly, it is also a wonderful place to meet up with the neighborhood, with food writers and wine connisieurs. We munched on the finest pesto bruschetta in my memory, sampled a rare white and discussed possibilities for another place for dinner. As recently as Aug. 25th Eater.com called Nopa one of the “toughest places to snag a table in SF,” but Ceri checked in with Nopa a favorite and when she gave us a thumbs up, we ubered over. Almost ten years in, Nopa is as vibrant as the day it opened. 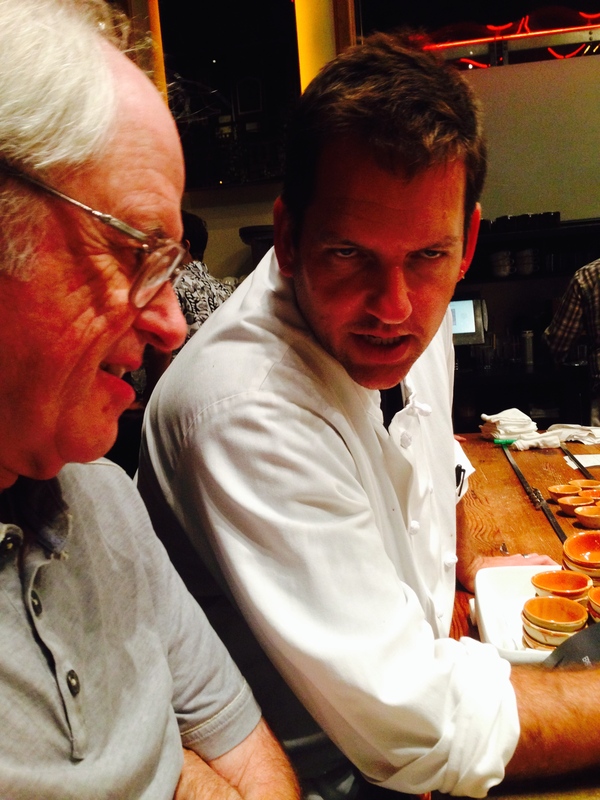 Both of us felt gifted when we were ushered to the seats at the chef’s bar next to the chef. To make matters better, Chef Laurence Jossel standing next to us checking and approving the dishes as they came out of the kitchen, initiated a conversation that lasted through out our dinner. He informed us that two thirds of the seats are reserved for walk-ins. If you do not mind a wait, dining is possible even without a rez. Lulu the sommelier checked in with us several times as well making sure that we had just the right wine pairing with our dishes. 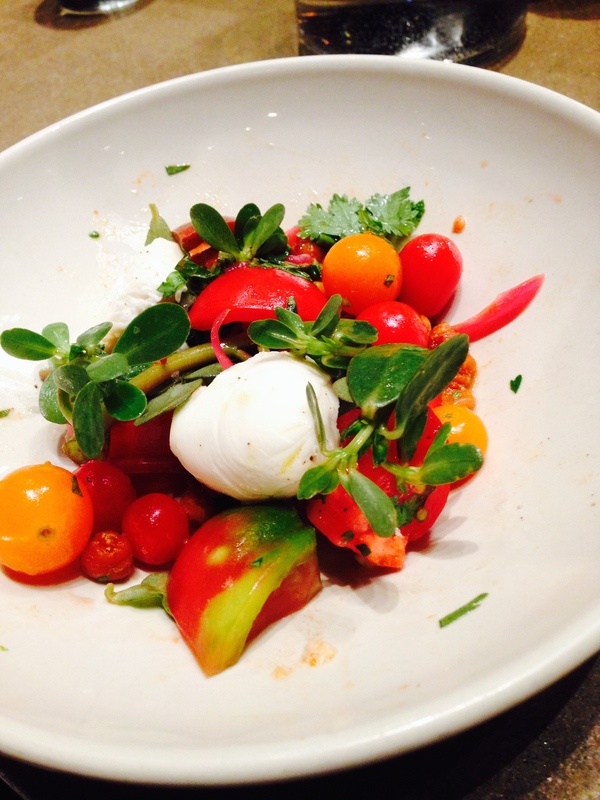 The food made with “local, organic and sustainable” ingredients is farm to fork at its best. Due to our earlier appetizers we had to limit our courses. When I tasted the warm water halibut I knew we had made the right decision. 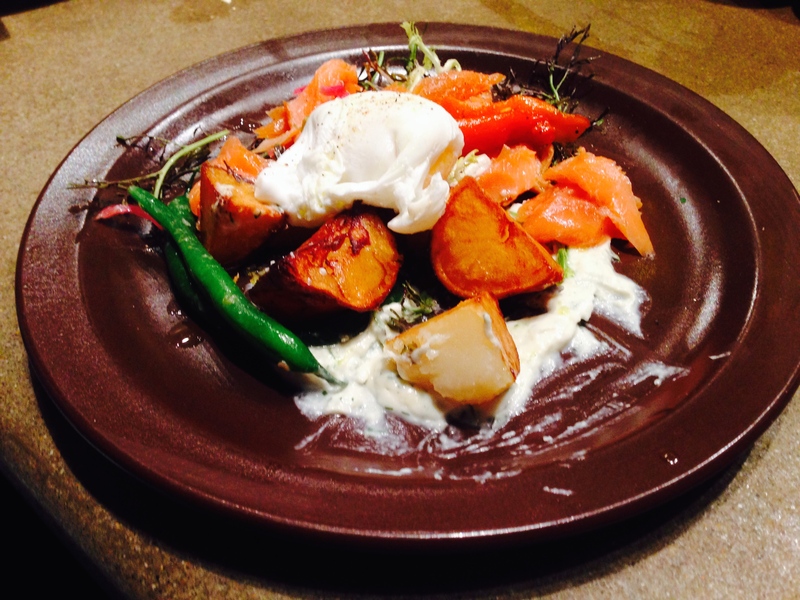 We followed with smoked trout, accompanied with crispy potatoes, horseradish, marinated peppers and poached egg. The tomato salad with spiced chickpeas, cilantro, lime and mozzarella could not have been more seasonal. We finished with small fried fish in dill and olive oil. Each dish was ample. Next time, we begin the evening at Nopa. I thought long and hard about a priced to the max SF restaurant. That I am a foodie, who refuses to eat in corporate restaurants, who requires welcoming, friendly service and healthy farm food when I dine out is not a secret. I search out progressive chefs who create veggie centric, but not necessarily an all vegetarian menu. I felt that my top choice for this celebratory occasion would meet all my expectations, still, the price tab at 248 per person, not including drinks or service charge, although less than the French Laundry, would be enough to make even the most endowed take note. Long story short, I held an internal debate. When it finally resolved, I decided to take the plunge and made a reservation. Check the next post for the result. August 29, 2014 Take a look at this! !